Little paperback novels and technical manuals are at the oposite sides of the book store but both share the need to be text to be part of why you read them. The novel since it requires a bit of a mental image that is unique to each reader and the technical book that needs to get the hard facts across. We have a long history in more advanced teaching methods. Most of these are interactive electronic books either online or downloaded that require interaction from the users. Generally the actions are as progress checks for knowledge or just to say you made it that far through the process. A new type of book is being called the ‘Vook‘. It is a electronic book you read, enhanced with video throughout. These might be popular with the kids some day as their comic books come alive but for now the long list of book offerings are either classics or advanced subjects that need a bit of video to tell the story (workout lessons, classics, instructional, Business, personal growth, reference, etc…). Do we still call these ‘eBooks’? Buy-In is a book that a few of us grabbed either through the local book store as print or electronic as a Kindle book to read on our iPads. 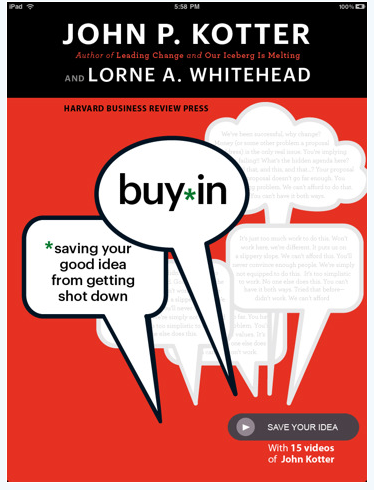 The book reads quickly and makes a few good points about how to get a new idea out of your head and keep it alive at work. Buy-In is also one of the options as a ‘Vook’. 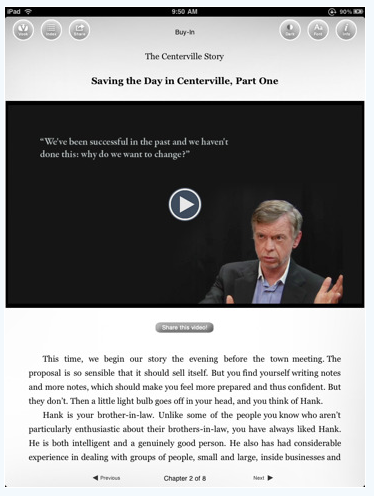 Still the text, chapters and page turners… but enhanced with video interviews and presentations throughout. For Buy-In (and a few other titles we tried), the combination works well together. While t wont be the way all books should be in the future, the combination works very well for many titles. There is no ‘reader’ application to download. The book with video is a complete universal app that can be read and video played without the need of an internet connection so you can continue to ‘read’ anywhere you and your iPad travels. The size of the file and the cost of the ‘Vook’ titles vary depending on the individual books.